The common neoclassical paradigm is by necessity limited to a specific behaviour of consumers. When it is accepted that utility is measurable and can be saturated, then it becomes possible to study the satisfaction of needs in a more general sense. This column starts with the analysis of the utility slope. Next a model of indifference curves by the Russian economist K.K. Val'tukh is explained. His formula can be applied in practice for the description of the target function in planning calculations with a many-period optimization by means of an intertwined balance. Jacob van der Wijk derives from the actually observed income distribution the form, which the marginal utility of money assumes in the society. Sam de Wolff calls his find a break-through1. Van der Wijk bases his model on the assumption, that all people have a similar ability for the acquisition of a satisfactory income, with an arbitrary spread due to natural talents. Therefore the density of the utility distribution, the utility u(x) = ln((x − m)/x0) of an income x, is a Gaussian (normal) function. 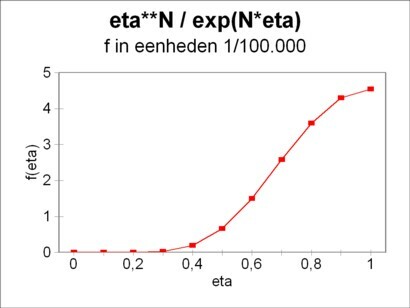 Here m is the minimum income and m + x0 is the expected value E(x), the average of all incomes. The neoclassical theory uses a utility function, which applies only to the separate consumer, and she does not contain information about the social conditions. She describes his preferences, but not his actually acquired utility. For the latter quantity depends on the income, which is at his disposal. The utility function of the individual m has the mathematical form um(x1, ... , xN), where xn is the quantity of the product n, which is at his disposal (n=1, ..., N; m=1, ..., M). Incidentally, the isolation of the individual must not be exaggerated. Individuals are raised and educated and assisted in their survival by their entourage. The individual preferences will always in a certain degree be determined by the social and historical conditions2. Besides the really existing social distribution of the utility, such as the one in the first point, also the socially desirable utility can be modelled. Unfortunately these two distributions will not automatically coincide. The socially desirable utility is represented by the utility function, which describes the preferences of a leading central agency. This utility- or welfare function has the mathematical form U(x1, ... , xN), where now xn is the quantity of the product n, which is at the disposal of the society. Apparently the central agency makes the decision in stead of her citizens, at least as far as the total supply of product is concerned. In a democracy this utility- or welfare function must be the resultant of the utility functions of all separate individuals, who together form the society. The function U is typical for the social welfare functions, that have actually been used in the practice of the Leninist planned economies. However, the welfare function in this form does not contain information about the distribution of the utility among the citizens, other than in the value of U itself. In fact U is preceded by another social welfare function, namely W(u1, ... , uM), where um is the utility of the individual m, or of a group m of individuals with similar characteristics. This is a welfare function, wich is commonly applied in the economics of the free market. The function W does not make statements about the desirable production structure, like U. Moreover, she is generally not interpreted as the target function of some central agency. W is meant first of all to formulate a just criterion for the distribution, so for a moral conceptual analysis, and not for practical purposes. In a previous column it has been explained, how originally the paradigm of the marginal utility was built on the assumption, that utility can be measured. When the idea of a utility measure is abandoned, and an ordinal utility is preferred, or even the concept of utility is entirely avoided, then also the intuitive appeal of this consumer theory disappears. Moreover her applicability is then limited to certain special situations. These are convincing arguments in favour of the measurable utility (cardinality). At this point it is worth mentioning, that the assumption of a measurable utility is essential for the study of consumer preferences in situations with uncertainty. The attention of your columnist was drawn to this phenomenen by the excellent economics weblog of Robert Vienneau. A simple example illustrates the idea of these studies3. Suppose that the acquisition of a product unit has a utility u1, and the acquisition of two product units has a utility u2. Now ask the individual to choose between: (a) obtain one product unit with certainty, or (b) obtain two product units with a chance p, where thus a chance 1 − p exists of getting nothing. Now it is intuitively clear, and it can be shown, that both options will be equivalent for him in the situation, where one has p = u1/u2. The rational individual must be able to estimate his own p, and thanks to this comparison can apparently also scale both utilities. Then he also knows their relative difference Δu/u2 = 1 − p. Just like in the previous column about cardinality, which was just mentioned, the utility can be measured simply by asking the individual! Thanks to the assumption of cardinality it is fairly simply to construct a model, where the acquisition of a product has become a burden. 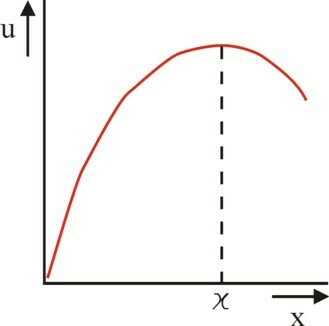 The figure 1 illustrates how in the beginning the utility u(x) rises with the quantity x of the product. At the point x=χ the saturation occurs, and henceforth more of the product will diminish some of that utility. The present-day common neoclassical paradigm of the marginal utility can actually not cope with this case, and that his surprising consequences. The problem of the figure 2a is, that the utility continues to grow. For it is simply not true, that someone is better off with for instance 100 watches instead of 99 (unless he is a collector). They become a nuisance and a burden4. A burden has a negative (marginal) utility, and will decrease the total utility of the individual. 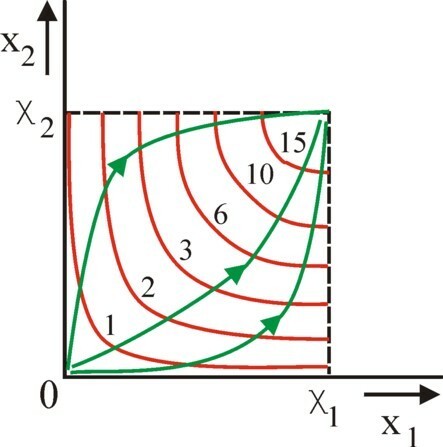 The figure 1 illustrates this for the one-dimensional case. Thus in the two-dimensional case the utility wall changes into a utility peak. This is displayed in the figure 2b. In the common introductory text books this aspect is often ignored, but not always. See for instance in Micro-economie by Dietz, Heijman and Kroese5. It is evident that the perspective on the whole concept of utility changes, as soon as the falling utility is taken into account6. In the previous column about cardinality it is stated, that an individual can never know the entire utility field, such as is displayed in the figure 2. That is impossible for humans. It has been explained how according to the Russian plan-economist K.K. Val'tukh and the Dutch economist Bernard van Praag the individual disposes of a limited and changing set of preferences. Suppose that at a certain time t the possessions in his situation consist of x(t), then he merely knows with some accuracy the indifference curves in the immediate vicinity of that point. According as the distance from that point increases, his indifferences become more vague. He has simply never considered them. Moreover the curves are continuously affected, because new products appear on the markets, which require the acquisition of experiences. There are several reasons for paying attention to the Leninist vision on the utility function. Thanks to the ideological controversy between the capitalist and planned economies the economists from the former Leninist states do not suffer from the stifling encapsulation of the neoclassical paradigm of marginal utility7. And their efforts are directed towards practical applications, more than in the west. The value-free and fundamental research consisted mainly of ideological policy studies and criticism of the capitalist system. It focused on the international "methodological debate". A disadvantage of this ideological approach is that the paradigm of marginal utility was distrusted. In fact the Leninist science seems to be more interested in the debate about the social policy than in formal-analytical arguments. So although the Leninist planned economists in general did not analyze the "subjective" utilities, this kind of research was not prohibited. Your columnist disposes of the book Entwicklungs-proportionen und Befriedigung der Bedürfnisse by the Russian economist K.K. Val'tukh, which contains many original ideas8. This paragraph gives a bird's-eye view of some of them. 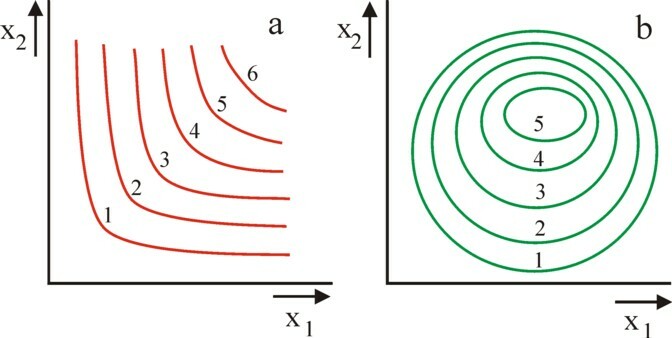 His model of the indifference curves has the unique hallmark, perhaps by necessity in order to obtain funding, that it has really been used in practical computations. Val'tukh develops a theory for the social welfare function U(x1, ... , xN), such as is described just now in the third point of the first paragraph. The utility function U has indifference curves, just like any other, but in this case they refer to the central planning agency. This agency is influenced by the opinions of the government, the ministries, the industrial and trading organizations, science, etcetera. Val'tukh imagines a utility shape, similar to the one in the figure 1. Here he stresses, that in fact the utility does not refer to a single product, but merely to a situation with a total package of goods. The separate products obtain their utility in the historical and technological context of the collectieve wealth and richess. Val'tukh places the concept of utility completely within the framework of the planning process, his employer. At a certain time t=0 the planned production has a given level, which is called by Val'tukh the normal level. Thanks to the planning process the productivity grows in a durable manner, so that a drop below the normal level will never occur. The planning process is only interested in the future growth above the normal level. So whenever this paragraph will discuss quantities x, this refers only to the growth above the normal level. The growth can be planned, and this is laid down in the so-called perspective plan. The corresponding time horizon covers a period of five or more years. The planning agency has the mission to satisfy the needs of all citizens in an optimal way, within the boundary of the perspective plan. According to Val'tukh the satisfaction of needs is simply the supply of certain services, which in the eyes of the planning agency are desired by the citizens. Needs are reasonable and their satisfaction is necessary in the given historical situation. The level of the perspectivistic needs is derived from the situation, where the demand is exactly saturated. In other words, the perspectivistic level is x=χ. A higher level can not occur, because that is undesirable, and therefore forbidden by the plan. Thus the planning agency must find a level of needs, which satisfies the condition 0 ≤ xn ≤ χn for all n. In the search process the quantities xn are adapted until finally u(x ) is maximal. Note also, that on a difference curve U = constant the exchange rate or marginal substitution rate ∂xj/∂xk must be negative. When a unit of k is given up, then the lost utility must be compensated by additional units of j. Therefore the convex side of the indifference curve points towards the axes of the field. In an indifference field (x1, x2) the rise of xj (j=1,2) above χj can only be prevented by imposing limitations on the exchange rate ∂xj/∂xk. As soon as saturation occurs for one product, then on the curve a further decrease of a quantity of the other product can be impeded by demanding an infinite quantity of the saturated product as a compensation. This requirement can naturally never be met. In order to be precise: when one has x1=χ1, then the exchange rate ∂x2/∂x1 must be zero. Here the indifference curve is horizontal. And when one has x2=χ2, then the exchange rate ∂x2/∂x1 must be infinite and negative. Here the indifference curve is vertical. In the same way the curve must never fall below the coordinate axes x1=0 en x2=0. For that would lower the normal level. So at the intersection of the indifference curve and the xj axis the increase of xj must not be compensated by a further decrease (towards negative values) of xk. That is to say, when one has xk=0, then the exchange rate must satisfy ∂xj/∂xk=0. Thus xj can only increase with an additional unit, when in compensation xk decreases with an infinite number of units, which is obviously impossible. This means in fact, that a difference curve ends, as soon as she intersects the axis. The figure 3 displays the indifference field of the planning agency, in line with the model of Val'tukh. Eventually the planning agency wants to reach the point x=χ, which is the top of the utility mountain, similar to the one in the figure 2b. The planning agency must choose a growth path towards the top, for instance one of the four alternatives in the figure 3. Since the utility function u will behave differently on each growth path, the optimal alternative must be selected. It is obvious that the growth path is a function of the time t.
Note that the determination of the growth path is fundamentally different from the determination of the "growth path" for individuals, in the manner of the neoclassical paradigm of the marginal utility. For the growth path of an individual is determined by the personal income. But the planning agency has the power to manage also the supply of the products. Here the production capacity must be taken into account, which is available at the time t=0! The management of the supply (in casu the production) implies, that the planning agency can vary the value (the cost price) of the products. The formula 5 proves, that C is a rising function of xj. Therefore C can be interpreted as a quantity, which indicates the utility of the package (x1, ..., xN) of goods. In other words, C plays the role of the utility value on the indifference curve. Thus U(x1, ..., xN) = C can indeed be interpreted as the equation of an indifference plane. As far as your columnist can see, this utility function is in principle an ordinal one. The formula 4 is very convenient for a planning agency, that searches for an optimal arrangement of the economic system. For the formula makes it possible to mutually compare in a qualitative manner the utility U of the various alternative production results. For this reason Val'tukh proposes to use the function U(x) in the formula 4 as the target function Z(x) for the optimalization computations during the economic planning. The loyal reader remembers the columns about the multy-period optimization, based on a intertwined balance. Often the target function Z in those examples is simply the size of the total product. The target function U=C of the formula 4 takes into account much more accurately the true preferences of the planning agency. However a practical disadvantage of this target function is, that she is nonlinear, contrary to the common target functions. That complicates the computations. Val'tukh has actually performed such computations of a multy-period optimization with an intertwined balance and his target function. The normal needs, the starting point of the computation (x=0), correspond to the situation of the USSR in the year 19679. The perspectivistic needs at the end of the planning period (x=χ) correspond to the consumption of the most prosperous income group of workers and officials, again for the year 1967. Val'tukh divides the intertwined balance into `11 branches, and in this way he can compute the optimal growth path. This completes the description of the essential ideas of the theory of Val'tukh with regard to social indifference curves. In the previous column about the cardinal marginal utility, which has just been mentioned, the vision of Val'tukh with regard to the historical dynamics of the indifference field has been discussed. Care must be taken to monitor the changes in the indifference curves due to the social development. As long as the field remains unchanged, the selection of the best plan can be represented by a curve in that field, a growth path x(t). With the passage of time t the planned production moves to the right and upwards in the field. If desired, next the formula 7 for C can be inserted into the formula 7. This η can be interpreted as a measure for the social progress, and therefore as an alternative utility function. In other words, the formula 7 is a nonlinear transformation from the utility function U=C to the utility function η. The interesting aspect about this marginal utility is, that for a given value of xj it increases according as all needs in the situation corresponding to η become more satisfied. For according as one has x→χ, it follows that η→1. Val'tukh calls it a law: the marginal utility of a product j rises, according as the total level of the satisfaction of needs (that is, the quantity η) is raised11. This discovery fits naturally well in the more general picture, which is sketched by Val'tukh, and where the (marginal) utility of a product refers exclusively to the general utility level of the total production12. De Wolff writes on p.220 of Voor het land van belofte (1954, 1978 reprint SUN): "The posterity will be more just. Certainly also here the time will come, when the marxism is again recognized as the ideological weapon in the liberation struggle of the working class. Then young eyes will read the texts of Van der Wijk and the work, initiated by him, will be extended. His writings will be translated into modern languages, so that it will be accessible for the whole world and the Netherlands will be proud that Van der Wijk has been born and lived here". Nowadays the name of Van der Wijk is attached to the law of Gibrat-Van der Wijk, so that this prophecy has rapidly come true. On the other hand it is necessary to remain vigilant against a possible encapsulation by the Leninist rhetoric. It may well be, that from the beginning the planned economy in for instance East-Germany has been built on an alienated and ideologically unsound view. A strong indication in that direction can be found in the book Die Ausnutzung der Ware-Geld-Beziehungen durch die Wirtschaftspolitik der DDR (1961, Verlag Die Wirtschaft). On p.108 and further in that book G. Pfütze argues, that the still existing capitalist (read: private) enterprises in the GDR are much more inefficient than the state enterprises. Their production costs would be much higher. On p.124 Pfütze even calls the private enterprises backward (zurück-geblieben). And on p.123 he discusses the option of centrally fixed market prices: "Sometimes it has been stated, that some want to eliminate the private enterprises with their low productivity by means of a unit price. It is naturally nonsense to introduce a fixed unit price without taking into account the discrepancy between the [low] labour productivity in most private enterprises and the average labour productivity in the socialist [collective state-]enterprises in that branch ... The solution of the discrepancy is only possible ... by a state participation in the private enterprises". Your columnist appreciates state enterprises in situations, where they further an efficient production. But he refuses to believe, that private enterprises are always structurally inferior. Apparently at the time the East-German state has "helped" a little in order to make the private enterprises "unprofitable", to its own detriment. The ideology was more important than reality! Also note the publication date of the book, evidently again an acquisition from the second-hand bookshop Helle Panke. Then there still existed a private sector in the GDR. Later it was almost completely eliminated.